For Muslims, the above catchphrase is taken even more literally than just holidays, parties, or a night-long drinking session, followed by a day-long hangover. Fridays are special to a sacredly auspicious level. According to the Islamic way of telling days, Friday begins as soon as the sun sets on Thursday, and thus marks what we Bruneians call “Malam Jumaat” (literally meaning Friday Night), and also known as Maurina’s favorite night of the week because she gets to see Boyfriend. It is also on Friday, that the Prophet Muhammad (Riwayat Abu Hurairah r.a) had mentioned of one special single solitary moment, where you may pray wholeheartedly and desire anything from Allah SWT, and whatever you desire will be granted. Rasullulah SAW (Riwayat Abdullah bin Munzir) also said, that it is only on a Friday that Judgement Day (Qiamat) will come. Thus, if you approach any single Muslim being on the face of this earth, they will definitely never dispute the importance and the venerability (if there is such word), of this day. 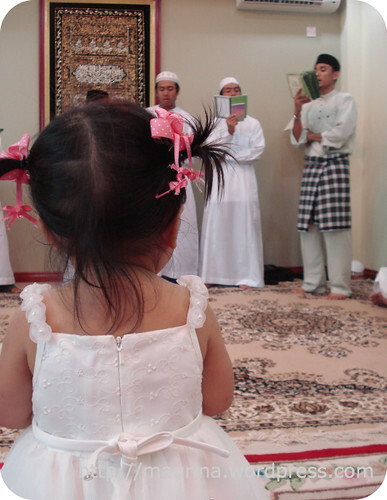 Due to its auspiciousness and the hope it offers to us small beings, many ceremonies, such as the Nikah part of a wedding (the exchange of vows) is almost always officiated on a Friday, and there is the special televised Friday prayer that is wajib for every single Muslim male in the country. It is also normal to see a portion of the female population, donning the tudong, and generally covering and humbling themselves more to respect Fridays. Some families spend a Friday, having a Berdikir ceremony. 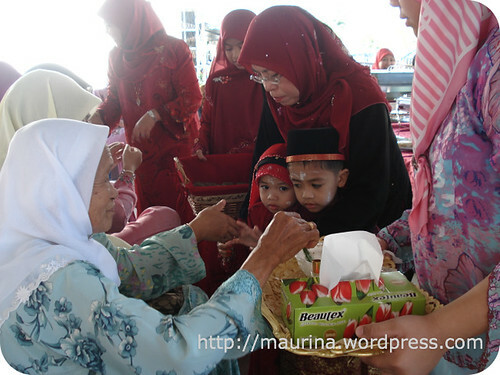 Berdikir ceremony, at least in the Bruneian context, obviously involve reciting the dikir. It is basically song-like, recited in Arabic in praise of Allah SWT and Rasullulah SAW and accompanied (but not neccesarilly) with a drum like instrument. Those who attend the Religious School in the afternoons will remember sessions where the dikir is learnt and practiced. A dikir ceremony, is usually done, when something joyous has just happened, usually something involving rites of passage, for example, circumcision. 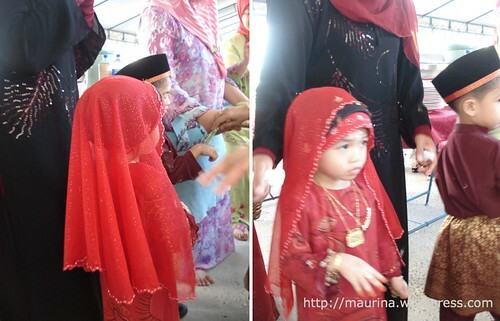 Basically what happen is, a group of people will be hired to specifically do the dikir, then the child who has been circumcised will go around the dikir group and the female guests’ canopy, with an an entourage, (while the dikir is in session). While going around to each individual, a white paste made of rice flour and water, will be smudged on their foreheads using a brush made of pandan leaves, a process called “membadaki“. 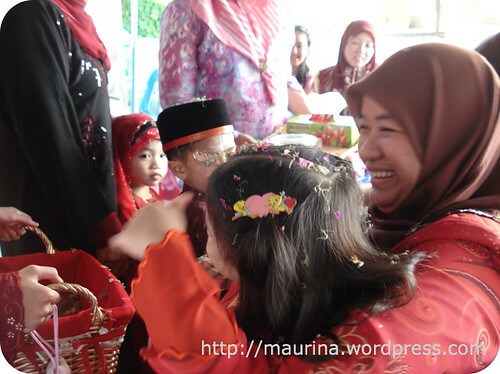 That is followed by sprinkling the “bunga rampai” (literally meaning mixed flower) over their heads, confetti style. Bunga rampai is made from pandan leaves as well, but sliced and diced into small pieces, mixed with a kind of flower we call Bunga Keratas (Paper Flower) or also known as the Bourgainvillea. Anyway, these two ingredients are mixed with a special kind of fragrance oil called the Minyak Duyung (Mermaid oil). 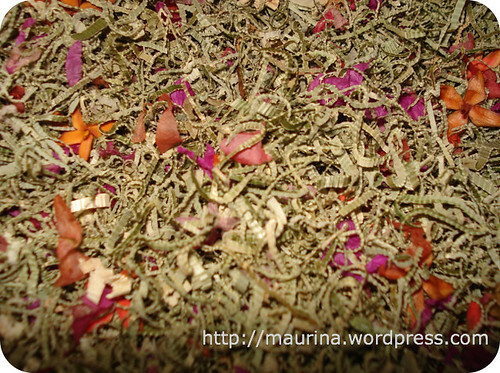 Disclaimer: The Minyak Duyung referred to in here is widely available in most department stores here in Brunei, and is not in any way affiliated with the Minyak Air Mata Duyung (Oil of the Mermaid’s Tears) widely used in Indonesian shamanism (specifically used to make women fall madly in love with the user). This is a very intimate ceremony, so most of those invited are usually very close family members and neighbours. Of course inviting the whole kingdom, which is usually reserved for weddings, could get extremely expensive, and not to forget rather tiring for the young ones. After all, they are the one who has to go around the canopies for the membadaki. 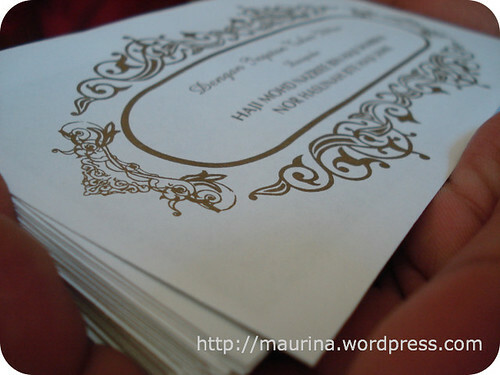 Next Post → Burning sensation?